Move to the cloud on your terms. Exchange provides you with flexible options for moving to the cloud, whether that’s onboarding to the cloud overnight or managing a hybrid deployment with mailboxes that are both on-premises and online. Limit user disruption when mailboxes are smoothly moved across environments, and let users share calendars and schedule meetings, regardless of the environment their mailbox is in. 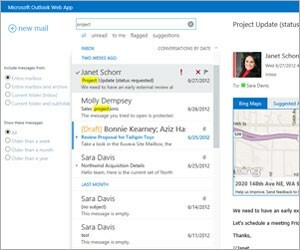 Try out upcoming enhancements in the cloud with support for upgrade previews. Decrease the amount of time spent on management, while maintaining control. Manage powerful capabilities, including Data Loss Prevention (DLP) and site mailboxes, from the Exchange Administration Center —a single, easy-to-use, web-based administration interface. Role-based access control empowers your helpdesk and specialist users to perform specific tasks without requiring full administrative permissions. This streamlined and intuitive experience helps you manage Exchange efficiently, delegate tasks, and focus on driving your business forward. Keep important data in one place with Exchange archiving, large mailboxes, and retention policies. 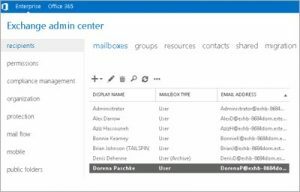 Empower your users with a large mailbox to allow them the flexibility to retain email in their primary mailbox or move items to an In-Place Archive. With flexible and powerful retention policies, you can take control of your storage and compliance demands while keeping your users productive. Eliminate email threats before they reach your network. Exchange actively protects your communications with built-in defenses against viruses, spam, and phishing attacks. Protect your sensitive data and inform users of internal compliance policies. Prevent users from mistakenly sending sensitive information to unauthorized people. 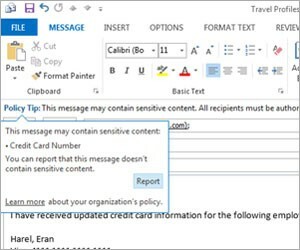 Data Loss Prevention (DLP) features identify, monitor, and protect sensitive data through deep content analysis, and PolicyTips in Outlook inform users about policy violations before sensitive data is sent. Built-in DLP policies are based on regulatory standards such as PII and PCI, plus Exchange can support other policies important to your business. Let your compliance officers run In-Place eDiscovery across Exchange, SharePoint, and Lync from a single interface. Ensure internal and regulatory compliance by using the new eDiscovery Center* to identify, hold, and analyze your organization’s data from Exchange, SharePoint, and Lync. The data always remains in-place, so you never have to manage a separate store of data.